The property forms one half of a Victorian semidetached property in York Conservation Area. The design provides a highly contemporary response to the existing Victorian property, whilst remaining subservient. 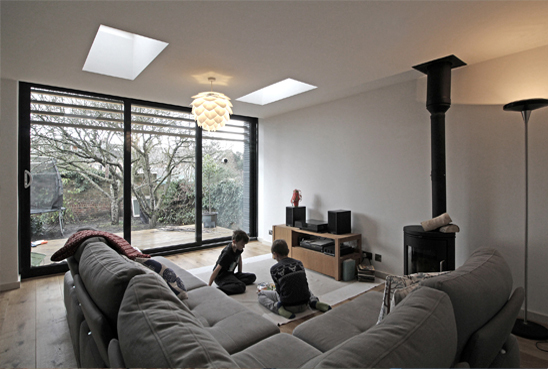 A glass slot provides a visual separation between the existing brick house and the extension, and the use of dark materials gives the impression that the extension is in the house's shadow. The design was conceived as 2 elements: a two storey element that is clad in slate grey fibre cement cladding boards laid vertically; and a single storey element that pulls away from the two storey box into the garden, clad in horizontally laid charred timber boards. A new raised terrace continues the internal floor finish externally and extends the living space seamlessly out into the garden.